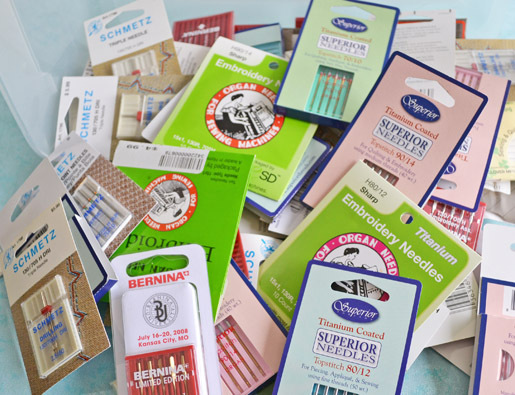 Super tips from Deborah Cacciamani, BERNINA Educator, on selecting the best needle and thread combination for your sewing projects. I have quite a collection of sewing machine needles. I just like to have on hand whatever I may need. 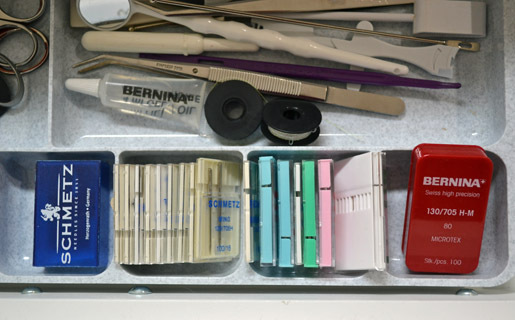 There are so many types of sewing machine needles, how do you know which one to use, and when??? Here are some basic rules of using the right needles and threads for your projects. Sharp or Microtex needles are for any woven fabrics. These needles cut through the fabric and are quite sharp. Ballpoint needles have a rounded point and are not as sharp. Rather than cutting the yarns of the fabric, they separate and slide between them. These are for any fabric that has any stretch factor – knits, spandex, etc. Topstitch needles have a larger eye and are great for threads like rayon and metallic thread. Specialty needles – Leather, Embroidery, Quilting, Metallica, etc. – are designed for specific purposes. Match the size of the thread to your project fabric and/or the application. For most fabrics, an all-purpose thread is good. For lightweight and sheer fabrics consider using 70-weight cotton or very fine polyester thread. For visible topstitching on upholstery and denim, use a heavyweight topstitching or upholstery thread. Once you have chosen the general needle type and selected your thread, choose the correct needle size for the size and type of thread selected. Small needles sizes – 60/8, 70/10, 75/11 – are best used with fine fabrics like organza and batists. A finer, lightweight thread is required with these smaller needles, as the eye of the needle is smaller and cannot accommodate a heavier thread. Using a thread that is too large for the needle can cause the thread to break. Medium needle sizes – 80/12, 90/14 – work well with quilting cottons, lightweight upholstery, denim, silk dupioni, and other similar weight fabrics. The eye of the needle is sized for general sewing threads such as all-purpose polyester and 50-weight cotton..
Large needle sizes – 100/16 and 120/18 – These are for heavyweight, tough fabrics, like thick leather, heavyweight canvas, and dense upholstery fabrics. They are used with heavyweight threads such as upholstery and topstitching threads. Tip: All thread is NOT created equal. If you are having constant thread breakage issues and you have new needles and everything else is fine, then consider the thread. I repeat – NOT all thread is created equal!!! Buy good quality thread, every time, for sewing that is FUN! Yes, buy good quality thread….but what is that??? I recently bought 6 spools of Gutterman topstitching thread, and the “threads” just unravel before you can even get it through the needle!! Very disappointed. We are often very limited by thread. 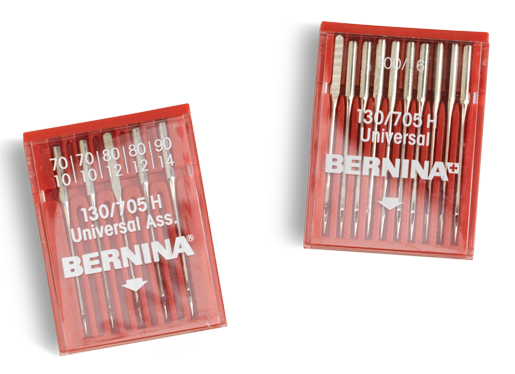 My Bernina dealer only carries quilting and embroidery threads.